Michael Strouse pleaded for forgiveness, but a judge sentenced him to the maximum Wednesday for murdering 23-year-old Ellie Weik and dumping her body in a field across from his house. "Please believe me, from the bottom of my heart I never wanted to hurt anybody," the 29-year-old Strouse said in a packed courtroom. "If there was anyway to bring Ellie back, I would trade places with her in a second." Judge Gregory Howard sentenced Strouse to 15 years to life in prison for murder plus 2 1/2 years on other charges. He will not be eligible for parole for 17 ½ years. 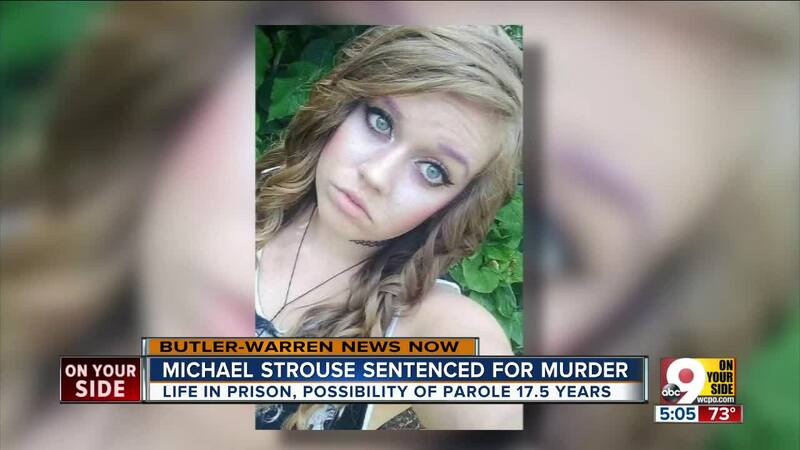 Strouse came to court with two black eyes following a jail altercation, according to the Journal-News. His family said he was “jumped and beaten” by an inmate at the Butler County Jail last weekend, which caused the black eyes. He was talking to them on video during visitation when it happened, they said. Major Mike Craft of the Butler County Sheriff's Office confirmed there was an altercation, but Craft said Strouse refused to prosecute. The inmate was disciplined internally. Weik's parents, sister Laura and a host of supporters wore bright colors and tie-dyed shirts in her honor. Supporters brought Easter eggs with written messages that described Ellie as warm, compassionate, sweet and nature-loving. Those eggs will be hung on two trees at Keehner Park that have been planted in her memory. Laura Weik gave a victim impact statement, telling the court her family’s lives will never be the same. Afterward, she told reporters they are "one step closer to healing." Weik's mother made a special request, asking the judge to change the date on her daughter's death certificate to July 29, 2018 - the actual date of her death - instead of the day her body was discovered in August. Though no motive was ever given, prosecutors say Strouse stalked and harassed Weik for months. Weik had a “distant relationship” with Strouse, prosecutors said, though they gave no specifics. Strouse pleaded guilty to murder, gross abuse of a corpse and menacing by stalking on March 12. Charges of tampering with evidence and petty theft were dismissed in exchange for the plea. The aggravated murder charge also was lowered to murder. The Journal-News contributed to this report.